Essity, the producer of the Tork brand of Away-from-Home professional hygiene products, announces the launch of its award-winning Tork Xpressnap Image Napkin Dispensing Systems in North America. Philadelphia, PA – April 20, 2015 – Today, Essity, the producer of the Tork brand of Away-from-Home professional hygiene products, announces the launch of its award-winning Tork Xpressnap Image Napkin Dispensing Systems in North America. Available now and on display at the National Restaurant Association (NRA) Show in Chicago, Ill. from May 16-19 2015, the new napkin dispenser collection is ideal for high-end establishments that prioritize creating a premium dining experience. The Xpressnap Image line includes two distinct styles – sleek aluminum and genuine walnut – each designed to fit seamlessly into a variety of modern foodservice venues. To complete the high-end guest experience, Essity is also announcing the launch of Tork Premium Extra Soft Xpressnap dispenser napkins designed to exceed customer expectations. These napkins deliver incomparable softness and an elegant look and feel that’s substantially different from other dispenser napkins, with six subtle leaf designs in each refill. Ideal for the emerging self-serve, yet premium foodservice industry, Tork Xpressnap Image is an elegant solution that adds to the overall ambiance of a dining experience. 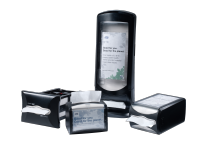 As part of the Xpressnap dispenser family, the Image line features the unique One Napkin, Every Time™ technology that ensures customers only touch and take one napkin at a time. 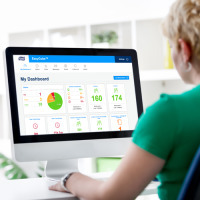 In studies, use of Xpressnap resulted in a reduction of usage of at least 25 percent* when compared to traditional napkin dispensers, and has the added benefit of being more hygienic. In settings where the guest experience is paramount, Tork’s collection of premium offerings including front of house, back of house and washroom can make all the difference. Research has shown premium furnishings can affect consumers’ perceived level of quality, as well as their willingness to spend more time and money at a specific venue.1 In addition to the Tork Xpressnap Image napkin dispensing systems, the Tork Elevation Line for washroom and the Tork Foodservice Wet Wipes for front of house cleaning are also ideal for creating a premium guest experience. National Restaurant Association Show attendees can visit booth #8413 to experience the new Xpressnap Image collection as well as Tork’s established line of foodservice products and dispensers. Contact Heidi Bobier, Weber Shandwick at hbobier@webershandwick.com or (952) 346-6027.